Called Madonna Verona, this fountain is the symbol of Verona. You will find it in the heart of the city’s heart. Since 1368 it has been standing proud in the middle of the historical Piazza delle Erbe – the beautiful square surrounded by stunning frescoed and lace-like facades – which is the epicentre of Verona’s life. Kids run around the fountain, splashing in its waters in the hot Italian days. At night groups of people, spilling from the adjacent restaurants and bars, surround it, large glass of aperitivo in hand, gesticulating and talking loudly, so that you get that unreal feeling of suddenly finding yourself in the midst of a film scene. the statue at the top of the fountain. Although called Madonna, she doesn’t represent the Virgin Mary. Instead, its name translates as ‘My Lady Verona’ and the statue symbolises the city – a queen with a crown, proud of her Roman ancestry and experiencing a rapid development during the Middle Ages. In fact, it is curious to note that this is an ancient Roman statue with medieval arms and head. How come? Well, according to its epigraphy the statue was originally placed on the Roman Capitol Hill in Verona in the year 380. 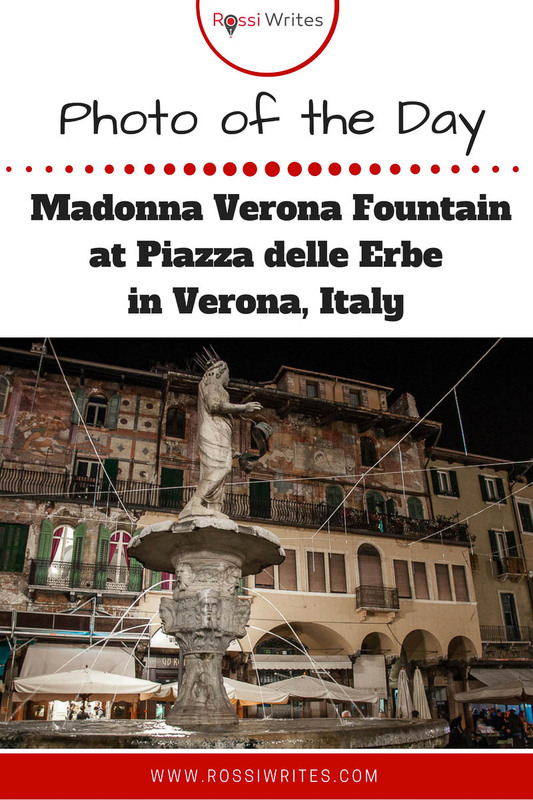 – Verona’s ruthless yet progressively thinking ruler between 1359 and 1375 – decided to erect the Madonna Verona Fountain. The fountain was in celebration of Cansignorio’s hydraulic success – he had brought water to Piazza delle Erbe from the stream Lori, the spring of which is in Avesa to the North of Verona. For centuries Lori had fed Verona’s Roman aqueduct and Cansignorio had managed to restore the water supply. The fountain was assembled using Roman and Gothic pieces. As such, its basin, made of red Verona marble, had been originally used by the Romans in their thermal baths. so it was repaired accordingly by adding newly sculpted parts. The statue (completely covered in gold, some say) was then placed on top of the fountain where you can still see it today. One last addition was made to it. Since 1368 Madonna Verona holds in her hands a copper cartouche with the motto of the city of Verona inscribed in Latin: Est iusti latrix urbs haec laudis amatrix. To this city – carrier of justice and lover of praise! The fountain was built, allegedly, by Bonino da Campione – a Lombardian sculptor in the Gothic style. He also sculpted the monument of Cansignorio della Scala outside the church of Santa Maria Antica in Verona. The faces you see carved on the column – which raises from the fountain’s basin and reaches to the pedestal of Madonna Verona – represent the old kings of the city. Among them is the mythical King Vero – the True King – whose name inspired the name of Verona – his Queen. The faces of Alboin – King of the Lombards, and of Berengar I – Duke of Friuli, can also be seen on the column. a sight you cannot miss in Verona. In your exploration of the city, you will end up walking by it at least once. Its position is not just central, but it seems to be the focus at which all roads in Verona – leading to its many other sights and places of interest – truly intersect. I took this night photo of the Madonna Verona fountain this past weekend. We were staying in the city for the night and went out to have dinner and see Verona under the cloak of the autumn dusk. I was amazed by how lively the city and, especially, the Piazza delle Erbe were. People were out in force, having fun and relaxing with their families and friends. – people having aperitivo with friends, people walking their dogs, people laughing and playing with their children. Madonna Verona, from her high vantage point, was observing it all. She has been there for almost six and a half centuries and, some say, her fountain is Piazza delle Erbe’s oldest monument. It was good to see her pale profile against the colourfully frescoed facade of the Casa Mazzini. It really brought in focus how special and beautiful Verona is – a city of splendid history, of breathtaking art, and yet a very modern place full of verve and life. This post is part of my blog series ‘Photo of the Day’. I use it to share with you photos which reveal the beauty and the reality of living in Italy and travelling in Europe. These are usually short posts (sometimes more of a caption, really), so that you can enjoy them on the go and use them to bring a ray of colour into each of your days.